Land Force laboured to beat TM Rockets 68-54 in an exciting First Division basketball Mini League match at the JMK court yesterday. The end-to-end game started at a crackling pace with both sides displaying impressive skills to the delight of fans. Though the prowess of both sides looked on equal terms, especially in aggressiveness, Land Force's better finishing gave them an edge. TM Rockets pressed upfront relentlessly in search of points in the opening quarter, but their efforts could not stop the well-drilled Land Force from taking a 21-13 point lead at the end of it. They (TM Rockets) created more chances, but poor finishing was their main undoing. There was an interesting battle between playmakers Joseph Rai of TM Rockets and Land Force's Abdul Twalipo in the first two quarters. The duo played crucial roles in their teams' attacks, but it was Twalipo who slightly got the better of his opponent, thanks to cooperation with his more efficient teammates. TM Rockets' big men Joseph Petar and Said Dina posed a threat whenever they approached the Land Force hoop, but they were checked by the defence manned by John Petar and Ally Juma. The match's tempo somehow slowed down in the second quarter because of a series of fouls committed by players from both sides. With a lot of three pointers' exponents in their side, Land Force exploited their arsenals fully to race to 34-26 lead at half time. TM Rockets players lost steam thereafter and were easily succumbing to tight marking deployed by their opponents, who effectively used Joseph Rai for defending and initiating attacks. Speaking shortly after the game, a visibly overjoyed Land Force coach Haji Juma showered praise on his players, but admitted that TM Rockets played a "decent" game. "My players performed well once again against spirited opponents. 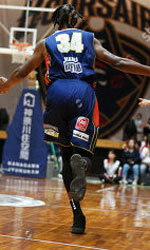 TM Rockets have experienced and talented players, but I am delighted that my boys overcame such a strong team," he said. His TM Rockets counterpart James Pius conceded defeat, but pointed out that they could have won the game had it not been for his players to squander many scoring chances. "We lost to a better team, but we had our chances which we fluffed. Had my forwards been precise up front, we could have won the match," he said. Land Forces' Abdul Twalipo and Gwakisa Edgar, who posted 15 and 12 points respectively, contributed much to their team's victory.